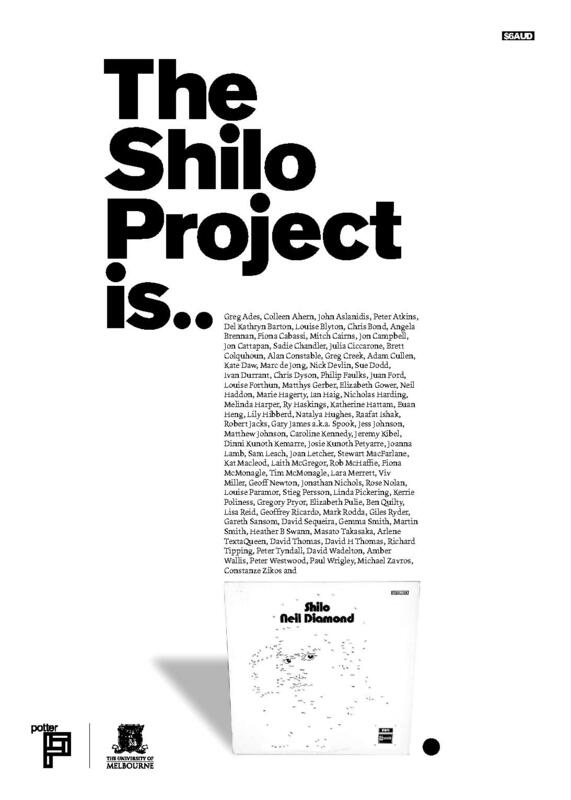 ‘The Shilo project’ was an art exhibition born in an opportunity shop on Victoria’s Mornington Peninsula. There I found two copies of Neil Diamond’s 1970 album Shilo. On one sleeve, the connect-the-dots portrait of Neil Diamond on the cover had been completed; the other was unblemished. Driving home, it occurred to me that it would be fun to ask artists to complete their own versions of the puzzle. The portrait genre (its relevance and viability) was an annual topic of debate, thanks to the popular Archibald Prize for portraiture. And the strange, hybrid character of the sleeve—minimal but playful—seemed to welcome artists who favoured and objected to portraits. What I soon realized was that this idle thought, initiated by a chance purchase, demanded realization. Later, as the exhibition took shape, I recognized that this surrender to fate was giving the project a distinctive character. As the Potter’s curatorial team approached artists, talked with designers and developed an exhibition tour, we sensed that everyone wanted the project to happen. In the end, over one hundred artists responded to the Shilo sleeve, each working on their own freshly printed front-and-back facsimile. In keeping with the go-with-the-flow spirit that triggered the project, each tour venue invited additional artists to join the exhibition along the way. There was a real pleasure in a rigorously-planned but inclusive project. Within the media, ‘The Shilo project’ was cast as a fun, retro-style exhibition. But it has always had a deeper conceptual core. The whiteness of the sleeve evoked the idea of a blank page, of the beginning of an artist’s work. The numbered dots of the puzzle suggested rules and conventions, a pre-ordained path towards a picture … the very thing artists avoid. You don’t know how paralysing it is, that stare from a blank canvas that says to the painter you can’t do anything. The canvas has an idiotic stare, and mesmerises some painters so that they turn into idiots themselves. I was positively awed by the wonderful interpretations of my Shilo album by the many talented artists of Australia. These works serve as a real inspiration to me as I continue to try to interpret the world around me through my music. The catalogue, interpretative signage and photographs of the exhibition can be found at the website of the Ian Potter Museum of Art.